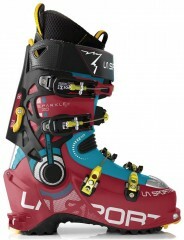 This La Sportiva ski boots truly sparkles. That is mainly due to the diamond dust in the soles that help it cut through ice and really grip. The Sparkle 2.0 also features upgraded ski performance over the 1.0 version, due to a reinforced lower shell. The boots still reign supreme when it comes to uphill efficiency in the four-buckle category, due to the low weight and surplus ankle articulation. And best of all, Sportiva offers a comfy fit with the EZ Thermo liners than can be custom molded to your foot. Sparkle-icious! EZ Flex Tongue has a flex zone for EZ skinning. Pegasus® buckles are secure and micro-adjustable. Carbon-infused vertebra improves skiing performance. Vibram® Ice soles are as grippy as ski boot soles get. Choose from 3 forward lean positions: 12°, 14°, or 16°. Bountiful 60° of articulation owns the skin track. Redesigned lower adds ~5% stiffness to previous version. 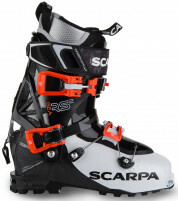 Compatible with tech, frame, and even TR-2 bindings.